BACK to life BACK to reality. For some reason this song pops into my head every Monday. In anticipation I decided to dedicate this Mondays post to the back. This peekaboo fashion statement isn't anything new but its sometimes an afterthought. 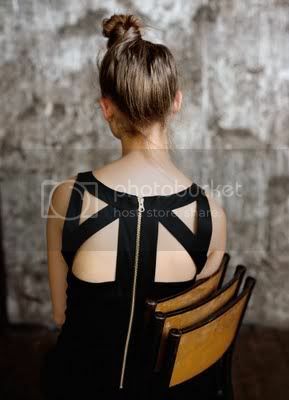 I don't believe I have ever said to myself I want a dress with a cool back. That maybe because I've had long hair my whole life (minus a year where I made a bad decision) even when I put it up in a pony tail it went down my whole back. I still have long hair but inspirational photos like this give me a good reason to go with an undo or a fake bob. Back to life, back to reality.. if I am going to have the song in my head you might as well as have it too. i love the whole "business in the front- party in the back" look of these shirts & dresses! it's so fun to put on something a little unexpected! i love shirts with something unexpected in the back. and if your can wear it reversed it's a plus! loving the peek-a-boo inspiration. it's a great trend, that can be difficult to accomplish with class. when i saw this post title on my blog feed the song instantly started playing in my head. what a laugh! love the topic! good idea! Cute looks. I've got a peakaboo little black dress that I love and a rad stripped tee, it's unexpected fun. Just stumbled upon your blog! SO GLAD WE DID. LOVE THE SEQUENCE BACKLESS. really HOT! Gorgeous!! I only have one dress with such an interesting back. But now I think I need more.